NETWORK FINALS: NBC’s NFL PRESEASON game adjusted up 0.03 to 1.9 in final numbers. Elsewhere, everything on ABC lost 0.1, leaving the rerun AMERICA’S FUNNIEST HOME VIDEOS at 0.9, CELEBRITY FAMILY FEUD at 1.1, FUNDERDOME at 0.7, and THE $100,000 PYRAMID at 0.6. In addition, CANDY CRUSH dropped 0.1 to 0.4. CABLE HIGHLIGHTS: The Wall came down, and so did another GAME OF THRONES ratings record, giving HBO’s behemoth a 5.70, up 0.99 from last week. That lifted BALLERS by 0.29 to 1.37, although INSECURE only held at 0.66. Adult Swim’s RICK & MORTY was big as well, up 0.11 to 1.37, with TIM & ERIC’S AWESOME SHOW at 0.42. TNT’s THE LAST SHIP was at 0.31, in the range of last week’s 0.34/0.30 premiere. FX’s THE STRAIN was steady at 0.31. Starz opted not to air the season finale of POWER against THRONES, but did air SURVIVOR’S REMORSE, which might have been a bad idea: it plunged 0.18 from last week’s premiere to 0.23. On Showtime, RAY DONOVAN dipped 0.04 to 0.23, and the rest of the line-up was below the chart, with TWIN PEAKS down 0.02 to 0.08/267K, EPISODES down 0.01 to 0.04/239K, and DICE steady at 0.03/135K. Hallmark’s CHESAPEAKE SHORES remained at 0.22. MTV has been touting its teen ratings for this year’s VIDEO MUSIC AWARDS because its slump in adults continued, down 0.42 on the mothership network to 1.36. The rest of its airings were as follows: VH1 at 0.36 (down 0.05), BET at 0.20 (up 0.01), Comedy Central at 0.18 (down 0.06), Spike at 0.20 (steady), TV Land at 0.14 (up 0.03), MTV2 at 0.13 (up 0.02), CMT at 0.07/189K (steady), MTV Classic at 0.04/62K (down 0.01), and Logo at 0.02/66K (down 0.01). 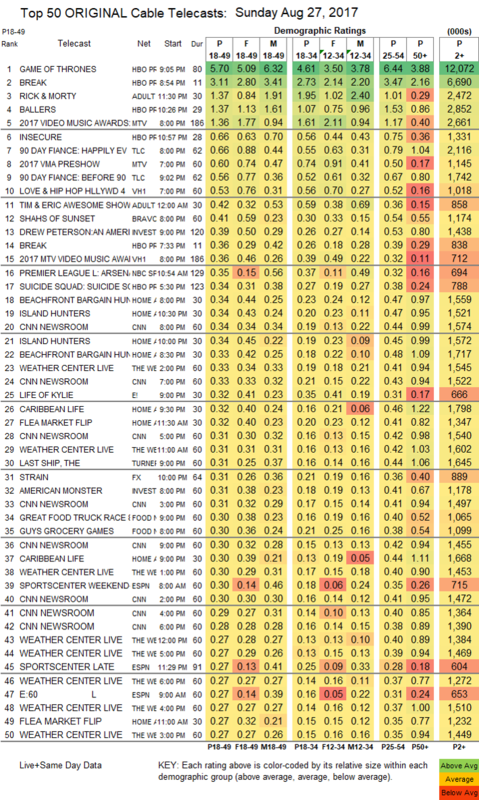 On TLC, 90 DAY FIANCE aired 2 hours at 0.66/0.56, compared to last week’s 0.66/0.59, and SPOUSE HOUSE was down 0.11 to 0.20. VH1 aired a special Sunday LOVE & HIP-HOP as lead-in to the VMAs at 0.53. On Bravo, SHAHS OF SUNSET slipped 0.02 to 0.41. ID’s DREW PETERSON special was at 0.39, and AMERICAN MONSTER was down 0.04 to 0.31. HGTV’s line-up was led by BEACHFRONT BARGAIN HUNT at 0.34/0.33. On E!, LIFE OF KYLIE dropped 0.03 to 0.32, and WAGS was down 0.11 to 0.15. 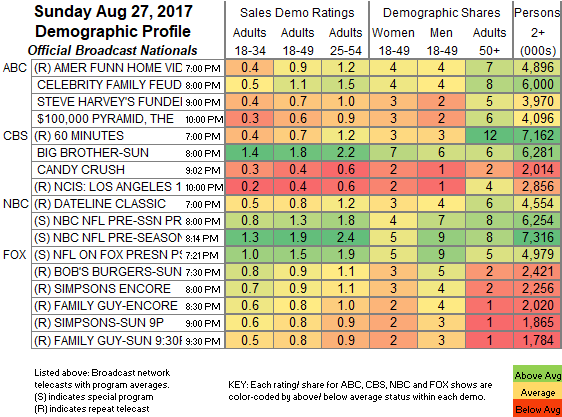 On Food Network, THE GREAT FOOD TRUCK RACE and GUY’S GROCERY GAMES were both at 0.30, respectively down 0.06 and up 0.01.